I was hoping that Steven Moffat would do away with these invasion-of-earth season openers, but aside from regenerations, it doesn't look like miracles happen overnight. That being said, The Eleventh Hour fares much better than the stories by Russell Davies which introduced a new companion -- even Smith and Jones whose plot it copies: an illegal alien disguised as a human, pursued to Earth by other alien authorities, around a hospital setting. We get shades of the atrocious Runaway Bride (the opening scene with the Doctor hanging outside the TARDIS as it careens uncontrollably over the London skyline), and the classic Christmas Invasion (the end confrontation, about planet Earth being "defended" before the Doctor sends off the Atraxi). Homage is felt everywhere. But where Davies used Rose, Smith and Jones, and Partners in Crime to dumb down to the lowest common denominator, Moffat respects our intelligence, and, rather astoundingly, manages to deliver a real crowd-pleaser. Let's discuss the story's major high point: the new Doctor himself. Matt Smith assumes the eccentric role with ease, and I've no doubts he'll be as good as Tennant if not better. I felt I was in good hands the moment he emerged from the crashed TARDIS all frazzled and said to Amy, "Do everything I tell you, don't ask stupid questions, and don't wander off." That's more bite than we're used to with Tennant, and reminiscent of Tom Baker who routinely barked condescension at everyone. Tennant was very good, of course, but by the end of his stint had become too domesticated for my liking. The eleventh incarnation is unsettling even at his most homey. My favorite scenes are at the beginning when he ungratefully spits out every piece of food given to him by the seven-year old Amy, and then tries solving the mystery of the crack in her bedroom wall -- the crack, of course, being a rift to an alien jail cell -- by ordering her this way and that. It's great stuff. 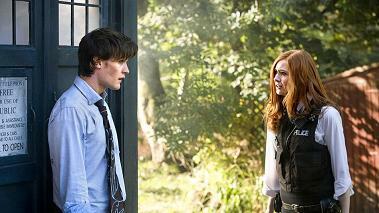 And the character of Amy Pond shows promise in a way that previous companions did not. Unlike Rose Tyler, Martha Jones, and Donna Noble, she doesn't come with dysfunctional family in tow. This is such a relief I can hardly convey it in words. While I certainly acknowledge that Rose's family was ultimately put to good use, especially with the dramatic involvement of Pete Tyler, the Jones and Noble families were more extraneous, and by the end of their respective seasons had become thoroughly irritating. Moffat gives us Amy sans parental baggage, breaking with at least a significant part of the Davies formula. In place of kitchen sink soap opera, Moffat substitutes tempus fugit drama for which he has become renowned in stories like The Girl in the Fireplace and Blink. 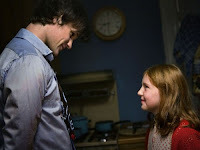 As in the former, the Doctor establishes a close connection with a young girl, leaves suddenly thinking he'll be "right back", but returns many years later to a grown woman who believes she had imagined him as a child. Amy, as a result, has baggage, to be sure -- she's seen plenty of shrinks to help cope with her "imaginings" -- but it doesn't need the watered down supplements of family melodrama. On whole The Eleventh Hour remains what it is: an invasion of earth story in which the Doctor saves the entire planet in the space of twenty minutes, and by (of all things) using a laptop to spread a global virus. But it's an incredibly fun ride, as addictive as The Christmas Invasion, drawing us back for repeated viewings almost against our will. And the ending is pure magic, as we see the new TARDIS interior through the eyes of Amy Pond, and are left just as awed. Rating: 3 ½ stars out of 5.